Alonso Gregorio de Escobedo, a Franciscan hailing from Andalucía, arrived in St. Augustine on October 7, 1587. Little is known about his life, except for what he included in his epic poem “La Florida.” Penned sometime between 1598 and 1615, this massive composite work was modeled after the metrically elegant style of the octava real, the preferred poetic structure in Spanish letters at his time. Written as a poem, rather than a historical document, “La Florida” is read today for its anthropologically significant information, such as the description of Indian fishing practices found in Canto 27. The complete manuscript, housed in the Biblioteca Nacional in Madrid, was published as a 1993 dissertation by Alexandra Elizabeth Sununu, and has appeared piecemeal in English, but has never been fully or adequately translated. In its entirety, the poem covers multiple themes including but not limited to the life of a model Christian named San Diego de Alcala, the Guale Rebellion, the experiences of the first Spaniards to travel to the Western Hemisphere, and pláticas (or sermons) with Biblical topics. The following selections include Cantos 27 and 28. In Canto 27, Escobedo judges the natives according to the customs of which he has knowledge, and he details their fishing practices. In Canto 28, he describes how the Indian leaders maintain the loyalty of their people, how the Indians play their ball game, how they bet on foot races, and how they bury their dead. Covington, James W. (ed.). Pirates, Indians and Spaniards: Father Escobedo’s La Florida. St. Petersburg, FL: Great Outdoors, 1963. Print. Escobedo, Alonso Gregorio De. La Florida. Ed. Alexandra Elizabeth Sununu. New York: Academia Norteamericana de la Lengua Espanola, 2015. Owre, J. Riis. “Alonso De Escobedo and “La Florida”” Hispania 47.2 (1964). 242-50. Print. Sununu, Alexandra Elizabeth. Estudio Y Edición Anotada De “La Florida”: De Alonso Gregorio De Escobedo O.F.M. Diss. City University of New York, 1993. Print. Alonso Gregorio de Escobedo, O.F.M. La Florida [ca. 1590-1610]. Draft translation by Thomas Hallock. Copyrighted; please do not reproduce without permission. Canto 27: This canto contains the way in which Indian witch doctors play with fire, how other Indians fish, and the various ways in which they hunt. that one should not die in misfortune. that banishes everlasting Death from death. the Catholic faith upon their death. in His hands, and become faithful Christians. who dwell in those far western reaches. glorious in their everlasting rest. Lucifer, the cruel liar, cast before them. who are not only sinful, but who sin over sin. made for this purpose in their huts. their fame and force, their position and place. his knowledge failed, he became wretched and poor. with such skill that the mob took him for a holy man. the intentions of another one. to the town with their vile promises. They are a miserable and sinful people. A people without justice (gobierno) or truth. A people who worship vile demons. A people who are all doomed to hell. A people wicked to the Virgin Mary. A people without sweet everlasting Jesus. A people without their natural reason. A people not like rational human beings. to swim with the fish at any new test. without showing any sign of fatigue. they are not righteous themselves. the fish are left there on the dry flats. to keep the fish from jumping out. that I must praise them for their efforts. choose not to atone for idleness upon their death. trawling through the salty, brackish flats. they have built in the shallow pools. they share their catch amongst the poor. none of them act misers to the poor. and the suffering of another is his own. they will find themselves nestled in eternal fire. and their souls cleansed from sorrow. may be brought to the light of justice. in the soverign God find solace? With baptism and the Christian faith: Yes. to complain and plead their case to the Lord. in complaining about your wages. but for those who judge, I pay enough. which is the Roman Catholic Church. who professes the blessed Christian law. he shall be paid with the palm of truth. and others, killed by skillful archers. not just their fowl but their pavo real. is plenty enough for the man who is famished. skillfully, following the most narrow paths. it flies straight through the life-giving heart. taken down by the hunter’s homicide. than what is made in the land of venison. when led to be and calm when at ease. even the fiercest, rugged and strong Spaniard. strike, always, with a steady hand. not letting their arrows be used again. because his arrows have been broken in half. Were they not broken, they would hurt our friend. gathering up the sharp arrowheads. against our soldiers who dress in mail. to their eyes or head, chest or neck. making a great sepulcre in the sand. who by his bad fate, is caught unaware. which will be recounted, in brief sum. which gives them life because of God. in this way, satisfying their hunger. he brings about the poor whale’s death. them with obvious courage and skill. from both sides of their canoe. It is a lesson learned from their ancestors:. with no escape for this ferocious beast. eat this, continually, in its place instead. along these smooth and sandy coasts. which refreshes (refrigera) the human nose. esteemed by kings and gentlemen. walk back and forth, a thousand times. beads made of glass as payment. more precious than pearls, gold or silver. bringing death to the faithful soldier. while inside, hellishly violent, abominable. Oh, the poor ship that nears the shores! by this nation, as blind as it is stupid. and are such rabid enemies to Christianity. then they would come to ask for forgiveness. and look away from their beastly dementia. of those greedy ones who wish us dead. board our boats before we can drop anchor. greedily paying the pagan’s price. which is coveted more than I can recount. can equal the ambergris in its qualities. and leave contented, with no suspicions. it is more valued than heavenly God above. is left lacking, he is sad and weeping. to feel the pain of what they need. in the waters bathed by that golden sun. the province where I was in attendance. catching many trout and delicious eels. and even the most valiant was afraid. the fish. They were dried in the breeze. silver from our faithful Christians. upon death to avenge the insolent. continuing tomorrow, on this theme. Canto 28: This canto contains the manner in which the caciques keep the loyalty of and do well for their vassals, how the Indians play the ballgame with their feet, how they bet on foot races of two leagues, and the manner in which they bury their dead. here the shame of being false to one’s word. the light of clear faith, and Christian law. and with good words, begs well of others. what I am saying to the wise reader. more than a league wide and long. gives license for the town to enter. so their their lord gives to them life. and swallow the entire cobs whole. like skeletons who have lost self-respect. they take any more, they will face great penalites. that the mountain of maize is much smaller sized. they lack reason, do not save for leaner times. because they do not plan more carefully. while the Indian often dies of starvation. that burns in the Pagan’s breast. tt would be a tremendous blessing. that give alms, but with bitterness. how one gives with the greatest contentment. on par with all who are impoverished. and come to follow, these people, his Laws. one can see not where the loose ball is going. they place a figure in a kind of straw cradle. they inflict on others unceasing pain. although they return to play everyday. because his feet does not leave the ground. strong arms, throwing him to the ground. and he must leave, and never return to, the game. of their enemy, until the fighting stops. who (on the other side) they want to crush. the game ends, the points are all scored. the moves that his opponent plans. battle mightily against their opponents. nor father on son, it makes no difference. he seeks vengeance against his enemy. hollers the signal for goal from far off. their team claims the victory. they feel, in their soul, tremendous loss. but for them are the principal treasure. and how is the loser valued? Disgrace. sometimes they crack open bloody noses. so great is the pain they hold inside. that strangles them, which they must suppress. he is not ignorant of the way out. that it carries across the brisk breeze. they lose their force, or if not, recover it. so much do the Indians esteem their own strength. his life he will take, from the demand. and later, eat these birds with delight. is won, and placed upon the winner’s head. fatigue presses them, showing in their faces. because this remedy could cause their death. that the whole world would laugh at it. the water cooling the runner’s passions. even thought is it the middle of siesta. finding contentment, always, in his skill. the same used to fatten a bristly and suckling pig. to feed the cacique when he comes. they eat this dish with great gusto. that the torta de gacha comes out whole. is by all Indians most highly esteemed. but shows how he is strong and courteous. brewed and valued by all as the best..
even when they are weakened by hunger. for all to eat who come to their home. against their vile enemies, off to make war. of the house this smooth, valued dish. in rations, to which soldiers are due. against our own, who are wearing mail. hang from their legs as from a garter. with tattoos, showing their ferocity and force. they are chosen to war against Spain. do not believe what the Castilian says. the law of God, the cause was the clothes. putting your rites out of our heads. Indian customs, so evil and fierce! so their dead may have plenty. that the dead sinner still feels hunger. are buried in a deep cave with him. instead all pay respects to the grave. without missing even a single day. they cover themselves with ashes continually. revealing four thousand lies to them. which like our bread, gives sustenance. that thousands of tumors born by summer. although there is great poverty at home. but eat only so his body will survive. weighted down from eating this heavy bread. making anyone who eats it angry. that death will come by this instrument. in another canto, recounted here still. gentil: “The idolator that had no knowledge of a true God, and worshipped false idols” (Sebastían de Covarrubias Horozco, Tesoro de la lengua castellano o española, 1611). Hechizar: Use image, “hombre hechizado,” from “Hechizar” in Covarrubias. provincias de la gran Florida: by “provincias” Escobedo would mean “colony,” and by la gran Florida a tremendous expanse, stretching from Key West as far as (by some maps) Nova Scotia. “si manifiesta de unos ser contrario / a otros de favor en esta vida”. tercia: the third part of the day in canonical hours, between the sixth hour (sesta, midday) and the ninth (nons) hour, or 3:00 pm. 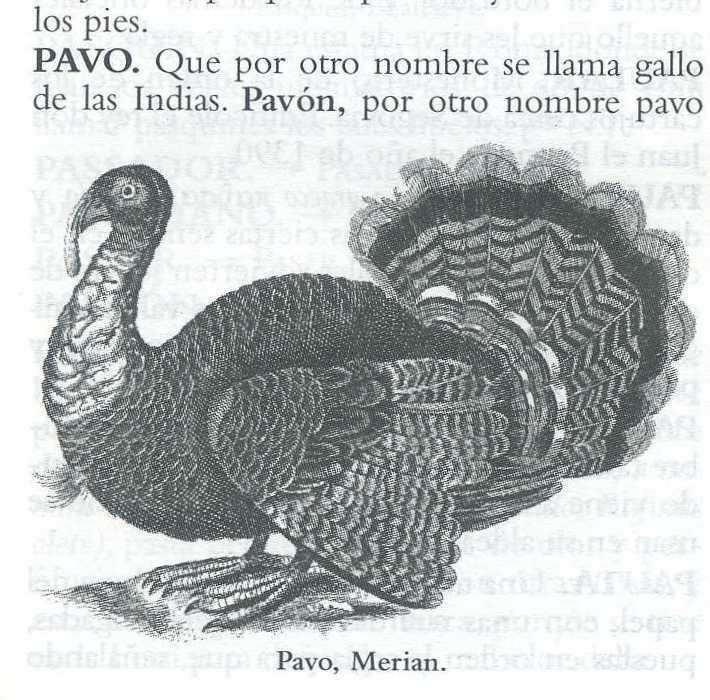 “pavo real“: turkey, as illustrated by Covarrubias, although the real following pavo also puns on the Spanish currency (un real). The discussion of the turkey, or “montesino” (thing of the woods) continues in the next stanza. Again, Escobedo puns on “homicida”: “ … pues al segundo salto de la vida / al indio cazador que es su homicida”. gamuza: “a type of mountain goat … whose skin is tanned to make breeches and “jubones” (vest?) (Covarrubías). boniatos: note on sweet potatos? corvinatas: perhaps sea bass; Falcones has mullet. Following Escobedo’s concession, Sununu includes corroborating accounts by Nicolás Monardes Alfaro, Historia medicinal de las cosas que se traen de nuestras Indias Occidentales (1565) and from José de Acosta, Historia natural y oral de las Indias (1590). Covington and Falcones speculate that the Indians wrestled pilot whales or (less plausibly) manatees (153n). In a long discussion of the subject, Covarrubías also asserts the belief that ambar, a “paste with extremely smooth odor,” was made from the “excrement” of a whale. On the availability of food, Escobedo contradicts other stanzas (Sununu 2:896n). Probably the coast of Fort Myers (Sununu 897n). “porné en la horca”: porné being an antiquated form of pondré, or take. Sununu has “porque a razón perdieron el respeto”; the manuscript, she notes, reads “arrazón” (2:903 taken here for “armazón,” or skeleton. “ … su pelota va siendo arrojada”: more literally, the ball goes about unpredictably and with force. Estado: measuring roughly the height of one man (Covarrubias). Cornado: fifteenth century coin, valued at one tenth of a maravedí; Covington and Falcones have “copper coin” (149). In the stanzas closing couplet, , Escobedo uses his favorite tropes of chiasmus and repetition: ” … por ganar, que quien gana, gana honra, / y gana el que perdió, suma deshonra. frutilla: probably acorns, although Sununu defines gacha (below) as a dish made from corn and honey, or what would be like the traditional softee. “Estos valientes traen la caballera / que al español quitaron con la vida ….”: Covington and Falcones translate this stanza to “These men wear on their legs, as if they were garters, the hear from some Spaniard who they have killed (151). Escobedo puns again on a favorite word, “homicidia”: que no va largando a tal comida, / por no ser de su cuerop el homicidia” (2:923) . Canto 29 recounts the efforts of French Huguenots to settle in Florida and the orders by Felipe II to Pedro Menendez de Aviles to attack the French.